It was one of those days when you can’t wait to get out on the water. It seemed to have been raining for weeks and now the sun was shining, the water was flat and there was a great-looking boat to explore. Gary Lovell reports. Approaching the Bluefin HT 700 you can tell she’s a serious fishing man’s boat – aluminium, high topsides, plenty of height to the hardtop, helm station well forward but well protected. The hull’s paint job should have warned me that all may not be as it seemed. Sitting on the Ezi-Loader trailer the Bluefin looked longer than its 7.05 metres – helped no doubt by the solid anchor prod at the bow and the 200hp Mercury sitting well back from the transom. And yet it looked narrower than its 2.5-metre beam – an illusion created I guess by the height of the wheelhouse and the width of the side decks. Launching was a breeze with the trailer’s multi-roller system allowing the boat to roll the length of the trailer with little effort needed from Jayson from Sportscraft Boats Ltd. It was just as easy loading it back onto the trailer at the end of our test. The Bluefin weighs in at a modest 1600kg, including motor and trailer. It’s built with 5mm alloy grade 5083 aluminium plate on the bottom (upgradable to 6mm) and 4mm plate on the sides. While the boat’s primarily designed for fishing, it has a number of pleasing compromises for the occasional family jaunt. Says owner Grant Greville: "She’s an awesome boat. I take it diving, fishing and gamefishing with a couple of mates, but it’s also a really good family boat for my wife and two kids." The cabin’s protected a large V-berth with a removable mid section that provides twin berths or a double option. The mid section also provides space for a portable toilet (stored under one of the bunks). Full-length shelves on both sides provide storage for the accessories and the full marine carpet lining should help to reduce the wave slap when at rest, even if it has little effect when underway. Squabs are comfortable with an attractive design and height above the berth is excellent. Privacy or protection from the elements is provided by a zipped canvas doorway which can be rolled up to one side. Light from the long windows either side, and a clear hatch above makes the cabin a bright roomy refuge by day and at night it’s illuminated by a single fluorescent light attached to the bulkhead. 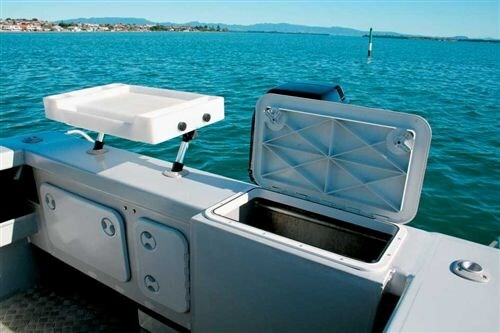 The wheelhouse is well set up with a large, flat parcel shelf fitted with a raised retaining edge. Like the cabin, the wheelhouse is lined with marine carpet – as are the long shelves that run down either side of the cockpit. The back-to-back seats fitted to this boat (one at the helm and the other alongside), are optional, but they’re a good option: with standard twin pedestal seats, storage and passenger seating would be seriously reduced. No gas strut seat on the seat but after driving I doubt that it’s necessary on this boat. The vinyl upholstery is comfortable and practical – easily wiped down. There are good storage areas under the rear seats, though I found the polyethylene seat boxes looked a little out of place among the aluminium and carpet. Likewise, the white locker hatch in the dark grey carpeted bulkhead in front of the passenger’s seat was a little glaring. It’s the merging of the wheelhouse and the cockpit that give this boat an edge. The wheelhouse gives excellent side protection to the helmsman and passengers and the top extends about another half metre further back. This boat enjoys an additional metre on to the wheelhouse top by the use of a retractable canopy. The head room in the wheelhouse is good at two metres at the helm seat and 1.95 metres under the overhead handrail on the trailing edge of the hardtop. Visibility is good through the toughened glass windscreen and large, acrylic side windows. I liked the side profile of the boat’s wheelhouse. The eyebrows over the windscreen, the rocket launchers built into the top and the vertical handrail that follows the shape of the wheelhouse’s trailing side edges all give the boat a functional but attractive look. There is also a full width handrail under the rear edge of the hardtop which is useful for steadying yourself in rough weather. It’s also excellent for "hanging off" when socialising in the cockpit. In the cockpit the tread plate floor, de luxe baitboard, live bait tank, three rod holders either side in the 300mm wide gunwales (with another five on the rocket launcher) all spell fishing. The wide gunwales are carried forward toward the bow and these together with the stainless steel hand rails, which run from just forward of the rear edge of the wheel house, make moving around the boat relatively easy and safe. There is a 180-litre fuel tank under the floor just aft of a shallow underfloor storage space. 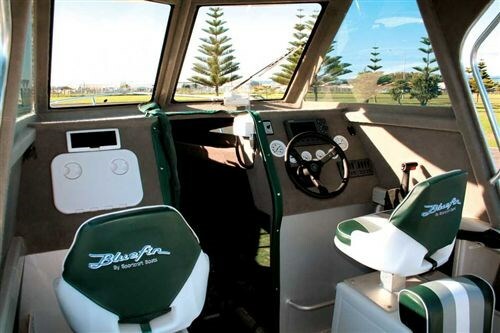 At three metres long and 1.9-metre wide the cockpit provides a good sized space for work (read fishing) or play. It’s a safe area for kids to enjoy boating, with nice, high gunwales and an uncluttered floor. The batteries and oil reservoir for the steering are both hidden in the transom behind closed hatches. They’re raised above the floor so that the cockpit can be hosed out to the rear bilge sump without obstruction. The motor is set well back from the transom on a pod and intrudes only slightly on to the swim platform, leaving lots of room all round it for whatever purpose – divers coming aboard, landing large fish, kids swimming off it, washing the dishes, etc. The only drawback on this set-up is the need to scramble over the transom to get onto the platform, as the live bait tank takes up the area where a step-through would normally be. But as the bait tank is optional the choice will depend on your priorities. The live bait tank is filled by pump and holds about 140 litres. It drains into the rear sump where it is then pumped overboard by the float switch operated bilge pump. 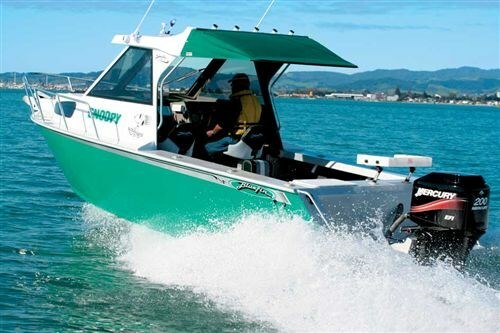 Out on a fairly flat Tauranga harbour the Mercury 200 EFI pushed the boat along pretty effortlessly, quickly getting up to 35mph at 4000rpm. At 5000rpm the log was showing 45mph and at full throttle at 5400rpm the speedo hit 50mph. The ride was comfortable and the motor noise in the aluminium boat was not intrusive. 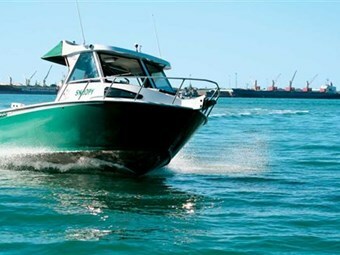 In the basic package Sportscraft Boats also includes a VHF and Navman 4430 fishfinder, although this boat was fitted with a Furuno GP 7000F GPS/Fishfinder. Also fitted is a Quick Windlass/Capstan operated by a switch on the instrument console – avoiding the necessity to go forward when lowering or raising the anchor. Wake jumping in the boat gave us a nice smooth ride without any pounding and the full length reverse chine kept the spray turned down and also helped to prevent slide on the corners. As you would expect with the Hydrive Admiral series hydraulic system, steering was smooth and held the boat on line beautifully in a "no hands" trial. She held a good straight line while crossing the wake at various angles of attack. The 17.5 degree deadrise at the stern increases only slightly at the maximum beam point. This gives the boat good stability at rest. Outside the harbour entrance we pushed the boat over a couple of bigger swells at speed and found that, even when close to being airborne, the landing was still relatively soft. The boat behaved well in tight cornering manoeuvres with no unwanted surprises. In an hour of high speed boating through whatever waves we could find we only managed to get spray on the windscreen on one occasion, so unless Grant goes fishing in the rain the fitted windscreen wiper is not going to get a lot of use. Whether it’s all out fishing with a couple of mates or taking the family for a fun day out on the water the Bluefin HT 700 will do the job in style and comfort. 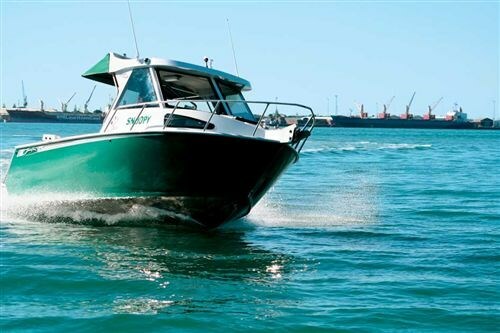 Price of test boat $68,689 incl the following extras: New profile hard top, back to back seats, extendable canopy, deckwash, cockpit light, canvas cabin door, windlass capstan, hydraulic steering, Furuno GP7000F, live bait tank, paint work.